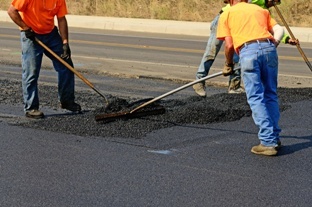 With the coming of spring and summer, more roofers, construction workers, road work crews, and others are using asphalt on the job and can be exposed to toxic asphalt fumes when it is hot. Both short- and long-term inhalation of these hazardous fumes and vapors can cause workers to suffer medical conditions such as skin rashes, respiratory problems, and cancer—sometimes life-threatening. However, many of these illnesses are preventable if employers took proper safety measures to protect their workers. How Can Employers Reduce Employees’ Risk of Injury Due to Exposure to Asphalt? Training. Employers should train workers in the dangers of asphalt and the safety precautions that they need to take. This includes training them in the solvents that are routinely mixed with asphalt. Substitution. When possible, employers should substitute a safer asphalt mix to reduce workers’ exposure to toxic fumes and reduce the risk of a fire or explosion. Mechanization. If mechanical devices are available that will limit an employee’s exposure to asphalt fumes, these should be utilized. For example, the use of a device to mix the asphalt rather than having workers mix it in a tar kettle can reduce their exposure to this risk. Ventilation. Having proper ventilation is critical to disperse dangerous vapors that cannot otherwise be controlled by enclosing the asphalt work to a limited area. In addition, flooding the work area with uncontaminated air can be a supplemental safety procedure. Respiratory and other safety protection. Employers should provide workers with the proper respirators that will protect them from both fumes and vapors and insist that they be worn when necessary. In addition, workers should wear protective gloves and shoes to avoid hot asphalt splatters and eye protection when chipping old asphalt. Many asphalt laborers work for non-subscriber employers who do not provide workers’ compensation benefits. If they are hurt on the job, they must prove their employer’s negligence in order to obtain compensation for their injuries. If their employer failed to follow safety precautions such as these to protect against injuries or illnesses from asphalt exposure, this may be evidence of their employer’s negligence. Did you suffer an injury or develop an illness from working with asphalt at your job? Call our office or start an online chat to schedule a free case evaluation to learn about your legal options.